Delhi Metro Rail Corporation (DMRC) has announced 3431 vacancies for the post of Assistant Manager, Station Controller/Train Operator, Customer Relations Assistant, Junior Engineer, Account Assistant and Maintainer. The online application procedure for DMRC 2016 recruitment has started and last date for registration is October 18. Interested candidates are advised to fill the DMRC 2016 recruitment form within the prescribed dates. The detail on DMRC 2016 recruitment like number of vacancies, eligibility criteria, selection procedure, important dates and how to apply are given below. Selection Process: Candidates will be selected based on their performance in written test (two papers), Group Discussion & Personal Interview followed by Medical Examination in Executive/Technical/Non-technical category. Application Procedure: The application form for DMRC 2016 recruitment can be filled in online mode only. Interested candidates are advised to read the application procedure carefully before applying because any mistake will lead to cancellation of candidates. 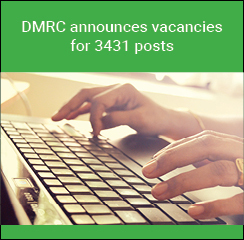 Candidates can apply for DMRC 2016 recruitment from the link given below on this page. per Indian Rly. Medical Manual. GATE qualified candidates for the year 2016. Three years Engineering Diploma* in Electrical/Electronic or equivalent or BSC Hons. in (Physics/Chemistry/Maths) or BSc (Physics/Chemistry/Maths) from a Govt. recognized University/Institute. Three years Engineering Diploma* in Electrical/equivalent trade from a Govt. recognized University/Institute. Three years Engineering Diploma* in Electronics/Electronics & Communication/equivalent trade from a Govt. recognized University/Institute. Three years Engineering Diploma* in Mechanical /equivalent trade from a Govt. recognized University/Institute. Three years Engineering Diploma* in Civil/equivalent trade from a Govt. recognized University/Institute.